The handsome doctor betrayed her trust. So the nurse kept a huge secret—their daughter! Eight years later, they’re working together again. The truth is sure to come out, but how will that affect them, and their families? Falsely accused of harming a patient, nurse Jan Garcia was hurt and angry that the man she loved, Dr. Zack Sargent, believed the charges. When she discovered she was pregnant, she reluctantly decided on adoption and had him sign the papers. Although Zack later learned the truth about her innocence, by then he’d married another woman after a short acquaintance. Broken-hearted at what felt like a second betrayal, Jan decided not to tell him she’d changed her mind and planned to raise their little girl alone. Eight years later, at Safe Harbor Medical Center, Zack is shocked when he runs into Jan and learns young Kimmie isn’t growing up in a two-parent family as he believed. Although the widowed obstetrician is determined to be part of her life, he also must protect his stepdaughter, who’s only a year older than Kimmie. Can this nurse and doctor forgive each other and face up to their simmering personal differences—at the risk of falling in love again? 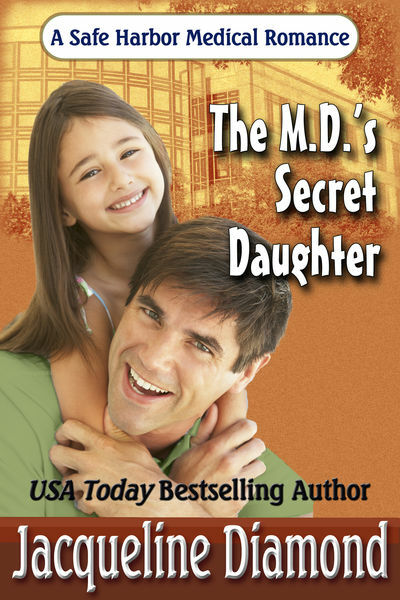 Described as “a delightful tale” by WeReallyDig.com, The M.D.’s Secret Daughter is Book 9 of Jacqueline Diamond’s Safe Harbor Medical romances.